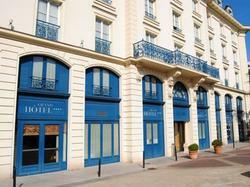 With a 24-hour front desk, Résidence du Grand Hôtel is located in the centre of Le Plessis-Robinson. It offers a fitness room and self-catering apartments and studios. Free Wi-Fi access is provided. Serviced by a lift, each accommodation type features a desk, a telephone and a wardrobe. The private bathroom is complete with a bath or a shower. Apartments and studios include a kitchenette with kitchenware, a microwave and a fridge. A buffet breakfast is served every morning and the hotel's restaurant serves semi-gourmet cuisine. Résidence du Grand Hôtel is 14 km from Orly Airport and 13 km from the Château de Versailles. Private parking is available on site at an extra cost and free cleaning service is provided upon arrival week. This spacious apartment offers free Wi-Fi, a fully equipped kitchen and 1 bedroom. A flat-screen TV is provided. This spacious apartment offers free Wi-Fi, 2 bedrooms and a fully equipped kitchenette. A flat-screen TV is provided. This studio offers a fully equipped kitchenette, free Wi-Fi and a flat-screen TV. This self-catering apartment offers a flat-screen TV, free Wi.Fi and 1 bedroom.